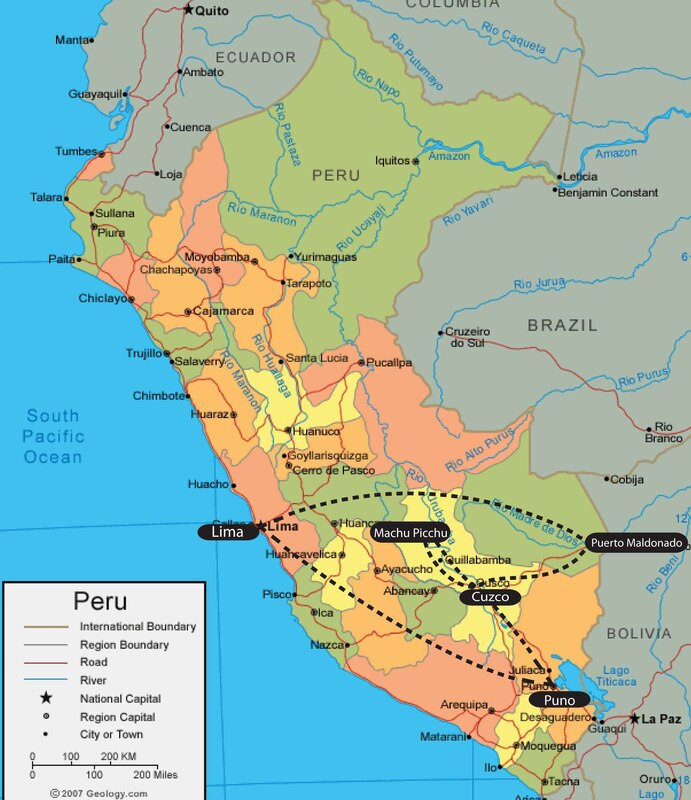 You Are Here: Home » Backpacking Destinations » South America » Peru » Peru… My Next Destination! Lately, I have been hearing everyone talking about traveling and I think this has got under my skin. So in October I am going to Peru! I have decided, I need a trip and a real backpacking trip. This is my plan… well so far. First step – Flight from Toronto to Lima. I am not so excited about Lima, so I am going to go directly to Puno to see Lake Titicaca and visit the Floating Islands of Uros. I plan to stay there for two nights. I scanned through some hostels already and so far it looks like the best one is The Point Hostel. Since it does over look the highest lake in the world. When I am in Puno, I wouldn’t mind crossing over to Bolivia too, but that is still on my maybe list. Second step – is to take a bus over to Cuzco. I plan to see the small town for a day and following that I want to do a two-day hike up to Machu Picchu. Only reason why I want to do a small hike is because I have little time on my agenda. I would have to take the train half way up and from there the 105km hike would begin. Now getting back to Cuzco would be the train. Since I am only doing a two-day hike that would leave me enough time to explore the Amazon. Third Step – A flight from Cuzco to Puerto Maldonado would only take me a day. Once I am there I would directly go to the hostel, at which I have already found one that seems good. It’s called the Anaconda Lodge. It is built like little bungalows surrounded by tropical vegetation of the jungle. Plus it offers a pool!Sounds already good to me. I think I would just find a local tour to help me explore the jungle a little. Maybe even do a little fishing. Once the jungle adventure is complete. I would fly back to Lima in order to catch my flight home to Toronto. Now this is just a plan, now for all of you who have traveled Peru please let me know what you recommend! From hostels, transportation, to highlights! Cheers. Seeing Machu Picchu and How Surprised I was. If you are looking for a good hostel in Cusco, I highly recommend the WalkOn Inn! Very clean, helpful staff, good beds and quite charming. Its close the central plaza (about 5-10min) uphill walk. It wasn´t really a complete backpacking trip for me as I had limited time so had to do a few tours, but still enjoyable. If you want to know anything else, let me know. Thanks so much for your information. I will keep you posted if I have any questions! I am so excited about this trip. I want to see everything. LOL. You should be excited! I loved Peru! I was so sad to leave! Enjoy it! In Cusco we stayed at Hostal El Triunfo. Very clean place and very nice people, it was next to the Plaza Des Armes. They also picked us up at the airport. You can look into that. We also stayed at the Anaconda Lodge in Puerto Maldonado, they also pick you up at the airport, they bring you to the office, they wait for a few other tourists to arrive and then you head for the jungle. You have a tour guide that brings you around. They give you time to rest so you can enjoy the pool. Very nice place. I needed some clothes to be washed and the owner washed it for me. If you want to know anything else, let me know. I was actually going to ask you about Peru , since I remember you went last year. I probably will have a few more questions to as you soon. Once the date gets closer. My boyfriend and I are going together, so we are super excited about trying to see everything Peru has to offer within 10 days or so. I dont know how much time you have and what you are interested in visiting, you know.. Machu Picchu is great but Peru have much more to offer!! if you are into the archeological there are tons of places to visit, in Lima you can surf, do rafting, paragliding, SHOPPING!! and of course EATING!! well if you have questions I would love to help you, I traveled most of my country and is beautiful everywhere! WOW thanks a bunch! Will for sure keep you posted with our plans. What other sites or places would you recommend me seeing?! My BF and I are going together, so we both really want to explore the country/culture! I will email you with a few more questions once the date creeps up closer. Hi Nara! well my husband and I are fans of the Chachapoyas Culture, there is a town “chachapoyas” in jungle frontier (up in the map) they have a lot of sites: Kuelap, Karajia, Revash. The problem is that it takes A DAY by bus to get there from lima (no flights) well for us it worth the visit, but you need a lot of time because the sites are far from the town so takes hours to get to different sites. Another great place is HUARAZ, in Ancash (by bus from Lima I think are 6 hours) they have Chavín de Huantar, National Park Huascaran, Wari Temple, lakes and wonderful sightseeing. Also in LAMBAYEQUE (12 hours by bus from Lima) there are a lot of sites: Lord of Sipan (Temples & Museums),, Zaña, Tucume, Chaparri, “chicalyo” is the main city and you can do great shopping there as well. CAJAMARCA is in upper Perú (16 hours from Lima) there are Otuzco, Baños del Inca, Cumbemayo, Santa Apolonia. AYACUCHO is great if you are a church fan, there are lots of them there in nice spanish arquitechture. AREQUIPA is I think the 2nd city after Lima.. very nice, ordered, clean, great food: colca canyon is there. Google those places PLUS Paracas, Nazca, Pozuzo, Mancora, Punta Sal, Huanchaco. As you can see there are lots of things to see but so few time!! Wow amazing! Thanks so much for all that info! I will google all those places and see where we are most interested in seeing! I will keep you posted with our plans! If you have time, I’d definitely recommend heading over to the Bolivian side of Lake Titicaca. The Peruvian side is spectacular, but the city of Puno is average and the Floating Islands, while fascinating, are very touristy. I don’t quite know what it is, but the Bolivian side seems to have some added mystery. The Isla del Sol and Isla de la Luna are beautiful and great for short treks. Definitely worth it if you have time.